Daniel was a graduate of Huddersfield’s Youth Academy, earning the title of ‘League One Scholar of the Year’ at the 2008 Football League Awards. He signed on a month long loan from Huddersfield Town on 15th January 2009 having made a number of substitute appearances for ‘The Terriers’ and had been capped for England at Under-16 level. 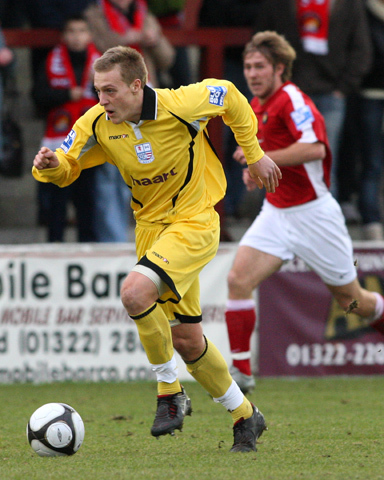 He made his Diamonds debut in the 1-0 defeat at Ebbsfleet United on 17th January 2009 and during his spell at Diamonds, started twice, and making one substitute appearance. After returning to Huddersfield Town after the one month loan, he had short loan spells at Gateshead and Harrogate Town in the remainder of the 2008-09 season before being released by Huddersfield in the summer. He joined Conference North side Harrogate Town in early August 2009, but went out on loan to Frickley Athletic on 25 March 2010 until the end of the season. He was released at the end of the season, and signed non contract forms with Frickley Athletic, but left on 10 September 2010 to join Northern Premier League Division One North side Curzon Ashton. During August 2011, Daniel joined Conference North side Hyde, scoring 5 times in 32 appearances, before going out on loan to Northern Premier League Division One North side Radcliffe Borough on 19 March 2012. Injury kept him out of the game for some time, but on 12 February 2013, Daniel joined NPL Division One North side Mossley. His stay was short lived however, and he rejoined Conference side Hyde just two weeks later on 26 February. He rejoined Mossley prior to the 2013-14 season.